Recently, one of my oldest childhood friends invited me and others from his Facebook community to share the ten books that have touched them over the course of their lives. Ah, this is perfect for me! I was an English major, I read a lot, and I love reflecting on what has affected me (and why) as well as what has affected others (and why). There was just one problem. I panicked at the instructions: Don’t think! (Really? Don’t think? Impossible!) List 10 books that have impacted you. Share your list and tag 10 friends to share theirs. I can’t remember anything I’ve read except for Little Women and Nancy Drew. Why can’t I remember anything I’ve read? How do they remember what we read in high school? I have no memory of those books. My list is not nearly as interesting as their list. There are only women authors on my list. Aren’t there any books by men that I remember reading that had an impact on me? Maybe I should Google lists of “important” books and pick some from there. Share with others? So revealing and embarrassing. To hell with this, I am not participating. Cue: stomp off and hide. It’s kind of like when a new friend or colleague asks you what your favorite movie is and the only thing you can come up with is a completely childish and uncool answer, like The Sound of Music (the original version with Julie Andrews). I have actually burned answers to some of these generic ice-breaker questions into my brain so that I am no longer caught off guard. I now answer the movie question with more recent movies that reflect more of who I am now and are more socially sophisticated (Wall-E, The King’s Speech and Gravity…oh and dare I admit it, Star Trek: Into Darkness). Why is it that all the books that come to mind are from my childhood? It makes sense that we choose books, movies, and heroines from our childhood. This is when a book we read really could and did affect the direction we pursued. The more troubling question that I kept pondering was why can’t I remember more? Every explanation comes back to trauma and anxiety and the role it has played as an undercurrent in my life. I read voraciously as a child. Especially in Summer when I was considered too shy and sensitive to go to camp. Instead, I stayed home and read. 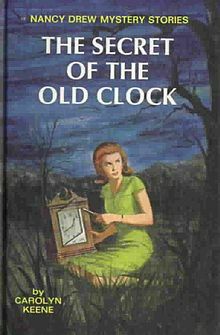 Not just The Secret of the Old Clock, but every single Nancy Drew mystery. Not just Little Women, but every single book by Louisa May Alcott. It was my escape and a way of learning about others. Girls who took risks and survived adventures were my favorite (and still are). I remember that at my loneliest, most anxious time in my teens and early 20’s, at the height of my disordered eating, I would eat alone and read while I ate. One bite per paragraph. That way the meal would last a long time and I wouldn’t have to face my lonely anxiety nor my gluttonous desire to fill the emptiness with food. It is impossible to remember what you read if you are focused on what you are eating. Another important part of remembering is to document your thoughts, your stories, either by writing them down or saying them aloud, perhaps multiple times. When anxiety felled me, I hid away. Not participating in the world, choosing instead to live in my head. I would say what I thought I should say, but not always what I really thought. What’s the right answer that will get me the A? It is impossible to remember what you read if you are focused on pleasing the teacher…or some other dominant authority figure. I was always embarrassed about revealing what I was reading. It was not cool. It was not sophisticated. Or maybe it was too sophisticated. (Who reads all of Jane Austen at 16? That’s just weird.) It is impossible to remember what you read if you are focused on hiding it and not sharing what you are reading and what you think about it with anyone. I see this with my mother. After multiple operations over the last 25 years to remove a benign but persistent growth on her vocal chords, she has nearly lost her voice. Indeed, metaphorically, she has lost her voice. Unable to speak, she no longer remembers her stories, the stories of her life. The stories in the books she reads to pass the time. I am convinced that she does not have dementia. She simply does not use her memory muscles because she does not speak. She cannot speak her truth. And…perhaps we don’t listen for it. Memory is funny, often elusive, and changeable depending on who is remembering, who is telling the story. The anxious, less confident self may not reveal her memory, her story, her truth. She may defer to the more confident – or at least the more dominant or authoritative person who does speak. For me, it has taken my writing and the increasingly less tentative telling of my stories and the expression of my thoughts to reduce my anxiety and make concrete my memories. Of course, perhaps the most helpful tool for finding my voice has been to be less focused on me, less judgmental of me, and more open to others. Who cares if my list is not “right?” So, even though I had to dig deep, here is a list (not necessarily THE list – that is too intimidating a requirement) but a list of 10 books that have had an impact on my life. Winnie-the-Pooh, by A. A. Milne. My mother read the Pooh books aloud to me many times, inspiring a life-long love of reading and writing and sharing. I felt very close to her. Little Women, by Louisa May Alcott. This book seems so quaint and dated to me now, but I lost myself in it every time I read it. Jo March showed me that girls could overcome their constraints. Nancy Drew mysteries (all of them), by “Carolyn Keene.” Feisty, brave, smart Nancy was my heroine. The Diary of a Young Girl, by Anne Frank. This introduction to the Holocaust and evil remains unbelievable and compelling. Mastering the Art of French Cooking, by Julia Child. Julia Child inspired me that dinner could be more than eating chicken and potatoes in 10 minutes at the counter. A Chorus Line, book by James Kirkwood, Jr and Nicholas Dante. Music by Marvin Hamlisch and Lyrics by Edward Kleban. A musical, not a book, that moved me profoundly and set my course in the dance direction for better or worse for decades. The Handmaid’s Tale, by Margaret Atwood. Transfixing terror. I couldn’t put it down. Perhaps the heroine’s name, Of-fred, was part of the fascination. A Room of One’s Own, by Virginia Woolf. Still an amazing feminist manifesto. The House of the Spirits, by Isabel Allende. Passionate and magical. Meditations from the Mat, by Rolf Gates. This book changed my life, expanding my appreciation of yoga and setting me firmly on my yoga journey. Where’d You Go Bernadette?, by Maria Semple. The first book of grown-up fiction I’ve read in years with a wonderful plot, heroine, and funny literary devices for telling the story. It made me wonder where I went. And to be happy that I’ve found myself. And interested in fiction again after decades of reading nonfiction and business-oriented books. What am I reading now? I just finished Mockingjay, by Suzanne Collins, the third and final installment of The Hunger Games Trilogy. My daughter turned me on to the series and I found it to be a page-turning suspenseful dystopian story with a strong heroine. My analytical engineer of a husband gave me a book on Reiki for Christmas. Hmmm, is this a sign? This energy stuff has always seemed like a bit of crazy hokum to me, but I am open to exploring it right now. And impressed with his thoughtful gift-giving. The other book that is on my nightstand is Wave, by Sonali Deraniyagala – the searing memoir by a woman who lost everyone she loved in the 2004 Tsunami. Why I would want to read such a painful book? I am drawn to stories of survival, women’s survival. These stories remind me of what we are capable of, what matters most. And, after all, I am a survivor. We all are. I, too read every single Nancy Drew Mystery and the Hardy Boys. I’m hoping to introduce my girls to them soon. Great List! Thanks! I found that my children were not that interested in my childhood favorites. Thankfully, there are so many wonderful books for kids today. “The Handmaid’s Tale.” What a great book. I thank you for bringing it back to my memory and I am hightailing it to my Kindle store to see if there’s a copy as soon as I comment here. Great post, great list. Kudos to you. Thanks, I am going to reread it as well!